Things that are grueling: 3 flights in a row to Australia, with two hours separating each leg. Grueling is worthwhile for a select few journeys, and today was one of those. I started my trek on Alaska Airlines before dawn and switched over to Korean Air in SFO. Did you know that in the domestic terminals at SFO, there are no screens indicating where you should go if you next leg is international? I was not expecting to be disoriented so soon, before I’d ever left the country. I was saving these feelings for Beijing. In much the same way I approach my life, I just kept moving and asking questions of anyone who held a vague sense of authority or intelligence despite also knowing the answer may never come. Lucky for me, I found a suitable answer to “Where do I go now?”, one I could live with to get me on my way today. It did involve checking in all over again despite having done so in SEA. (Turns out Alaska is small potatoes and their standard boarding passes are not approved in SFO’s international terminal. This was additional salt in the wound from the night before where AK wouldn’t let me check in, in advance. Hrmph.) Well, whatever, I didn’t complain since I had my eye on a prize on the other side of the TSA: the Air France lounge. I barely had enough time to read the charming coverage of rural Louisiana in the AF mag (EN FRANÇAIS), before heading off to pre-boarding. As they closed the doors at SFO, I heard the flight attendant tell another traveler that it would be 12 hours to Seoul. WAIT, WHAT? STOP THIS TRAIN I HAVE TO GET OFF. SFO-Seoul flight time was a detail I hadn’t cared to pay attention to before that moment. This is hilarious when you consider that I’d previewed the layout of my cabin on Google image search and watched videos of the sleeper-chair I’d have and I knew a week ahead what I’d be ordering from the in-flight menu. Bibimbap for lunch, Beef Galbi-Jim for dinner. I guess the flight time never mattered in the overall scheme of things. Then or now, really, cause it was just going to be awhile. I’m lucky enough to be flying in front cabins for the vast majority of this grand adventure, but the constant movement took its toll nonetheless. As I slogged across Incheon’s airport, I marvelled at how sloppy & underdressed I felt for such a fancy mall. 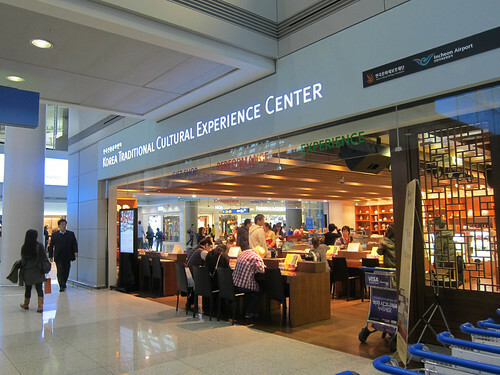 Korea’s invested quite a bit in this airport — there was a classical singer performing with an audience in one section, and I spied several Korea Traditional Cultural Experience Centers (Naomi had told me about these!). They’ve mostly upstaged Singapore, if you ask me. And if you overlook the archaic security checkpoints where they went so far as to pull batteries out of my camera for closer inspection. Singapore’s too efficient for that nonsense. Had I not been so exhausted and in need of recharging at the Korean lounge (can you hear the tiny violin? ), I would have stopped in the Center pictured above for a little traditional Korean craft time. Crafting! Can you think of anything more soothing before a flight that doesn’t involve a prescription? Next time, Incheon.